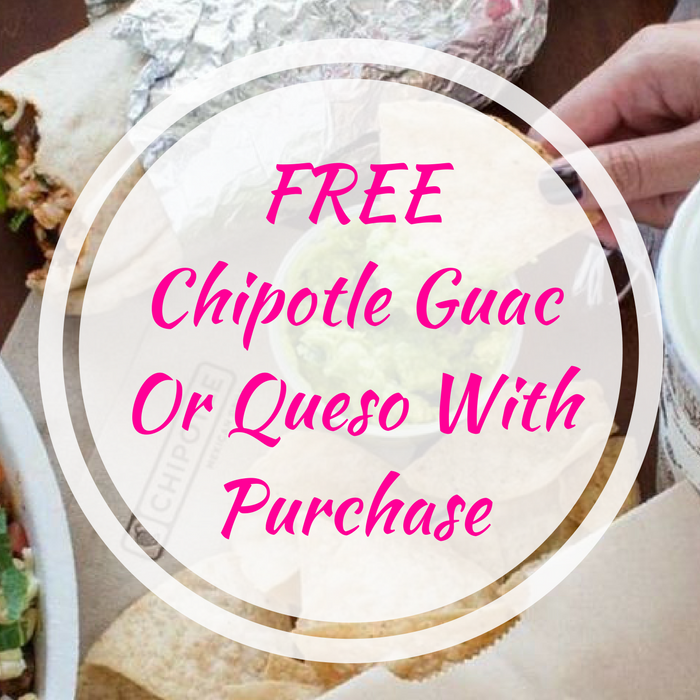 FREE Chipotle Guac Or Queso With Purchase! You are here: Home / FREEbies / FREE Chipotle Guac Or Queso With Purchase! This offer is until April 15 only! Download Chipotle’s New App here and score a FREE Guacamole or Queso on your next order! This offer is valid for first-time downloaders only! All you need to do is click here for Apple iOs or here for Android. Once you download, sign up for an account and your FREE Guac or Queso offer will pop up in your offers tab. Just show the offer when ordering and you will receive a FREE small order of Guac & Chips or Queso & Chips when you purchase a regular priced menu item. You can also opt to have your free Guac or Queso added to your entree item. Nice!